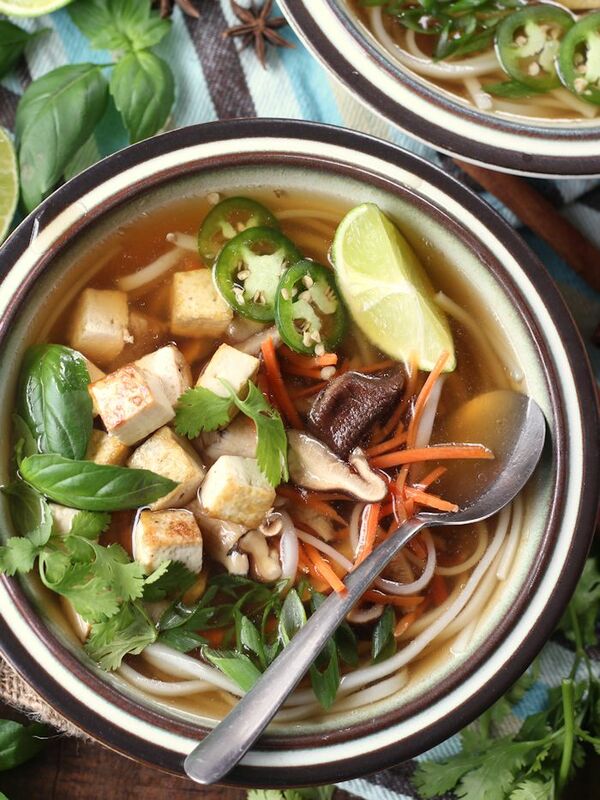 Toasty spices and veggies are simmered in vegetable broth and ladled over silky rice noodles and crispy pan-fried tofu before being topped with hoisin sauce and fresh herbs to make this restaurant-worthy vegan pho. The best part? It comes together in less than an hour! I’ve enjoyed quite a bit of Vietnamese food, but it was forever before I actually got to try what is perhaps the best known Vietnamese dish of all: pho. 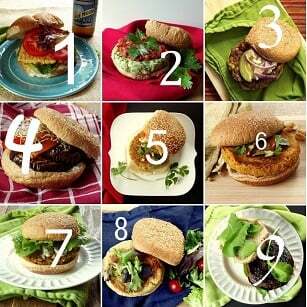 Nobody has a vegetarian version! Most of the Vietnamese places I’ve frequented offer a vegetarian option called something like “vegetarian noodle soup,” which is not pho. I know this because I finally found some veggie pho, and it was way better. So have you had pho? It’s amazing. Tastes like Christmas. Seriously! I actually thought of holding off on posting this until we were well within the holidays, because it would make some mean party food. Dress your own pho party complete with toppings bar? You know you want to. When I started seeking out pho recipes I figured out why nobody has a vegetarian version. Normal pho involves hours and hours of simmering meaty things in broth. I guess the restaurants I visited didn’t feel like bothering with a separate meatless broth, for simple lack of demand. 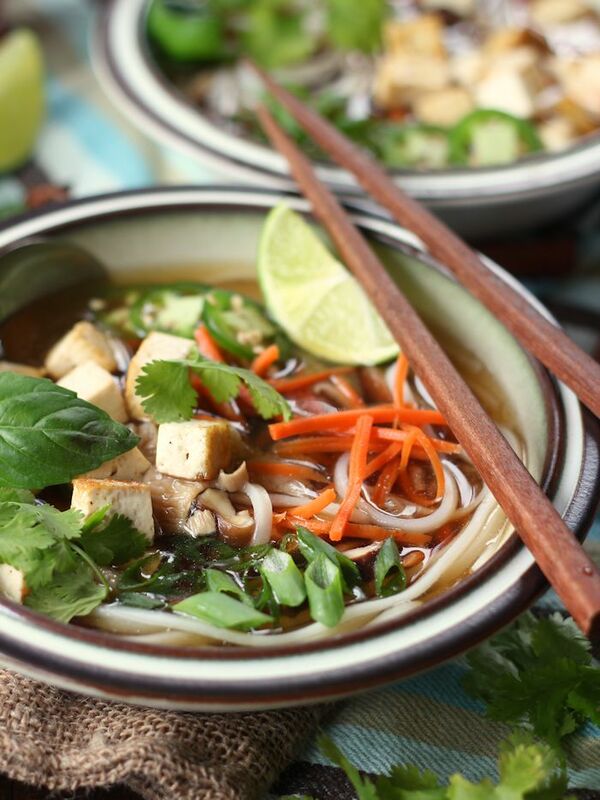 So, did I simmer meatless things for hours and hours to make my vegan pho? No, I took some shortcuts, but don’t worry, it was still like magic in my mouth. Normal pho recipes call for charring onions and ginger over an open flame, which I could do, but figuring not everyone has a gas stove, I gave broiling a shot. It worked! Then I simmered whole spices. I had the whole spices on hand, and perhaps you could sub ground spices, but I don’t know if that would be as good. It certainly wouldn’t be as fun or look as cool. So splurge for some spices. A brief 30 minute simmer did the trick. Pour vegetable broth into a large pot and place over high heat. Bring to a simmer. While broth heats up, place onion and ginger onto baking sheet and place under broiler. Cook until lightly charred on top, about 4 minutes, watching carefully to avoid burning. Rotate and cook until charred on opposite sides. Add onion and ginger to broth, along with cinnamon, star anise, cloves and soy sauce or tamari. Allow to simmer for at least 30 minutes, adding a bit of water if the mixture reduces too much. While broth simmers, cook noodles according to package directions. Drain into a colander and rinse with cold water. Coat the bottom of a large nonstick skillet with oil and place over medium heat. Add tofu cubes and cook about 10 minutes, flipping once or twice, until browned on multiple sides. Remove from heat and transfer to a paper towel. When broth has simmered for at least 30 minutes, use a slotted spoon to remove onion, ginger and spices. Add shiitakes and simmer until tender, about 4 minutes. Add carrots and simmer just until slightly tenderized and bright orange, about 1 minute. Divide noodles and tofu among bowls and ladle broth and veggies over top. Serve with toppings of choice (preferably all!). I used 6 star anise, but I really like a lot of anise flavor. Just a warning so nobody overdoes it! I love Pho! Basically anything that can be served family-style (do-it-yourself toppings) is great, and soup is great, and spicy food is great, so you really can’t go wrong with it. Charring the onion is a good call, I’ll have to give that a whirl next time. I’m definitely with you on all of that! The charring gives it a little bit of smoky flavor. Enjoy! I made this recipe last night, and it was amazing! Followed directions exactly as indicated except that I didn’t have star anise on hand so had to sub anise seed (1 tsp = 2 star anise). Thanks so much for the recipe–it’s definitely a keeper. Yay! So glad you enjoyed it! Thanks Jess! I thought I’d never be able to have Pho again from our local Vietnamese restaurant because it’s made with beef or chicken broth. Even with my tweaks (adding some ingredients, missing others and sauteeing rather than broiling) it still came out delicious! Excellent recipe. Thanks for sharing! See if you can find Thai (purple) basil and Asian cilantro. They will make this dish taste more “authentic”. Also I always glaze the tofu with a mixture of soy sauce, sweetener and sesame oil, sometimes a bit hot sauce as well. 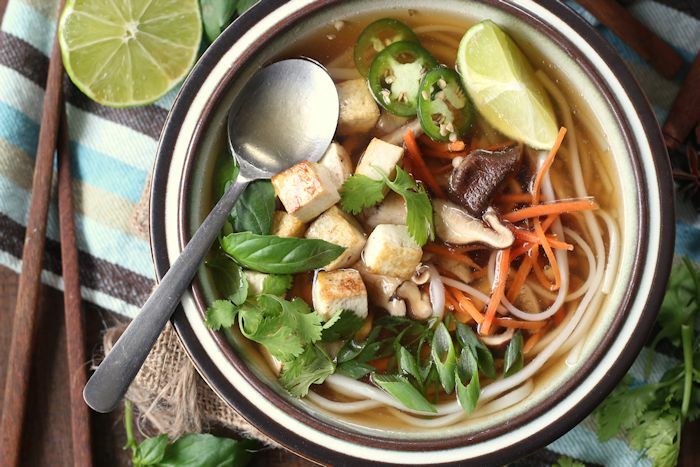 Best veggie pho recipe I’ve found so far! Thank you!! I’m so happy to hear that! Thanks Michelle! This was my first time making homemade pho and it turned out great! I will make this again. Glad you like it!! Thanks Emily! Just made this soup – WONDERFUL! I didn’t have bamboo shoots or bok choy but I added broccoli and carrots. Added an extra Tbsp of sugar, rice vinegar, sriracha. and soy sauce. (used sriracha in place of the chili paste) as well as a bit of sesame oil. Awesome!! I’m so glad you enjoyed it! Thanks so much! This was easy to make, and tasted so great!!! Saved this one for sure. I am about to make more since the first pot is gone! Awesome!! I’m so glad you enjoyed it! Thanks Toni! This looks good! Can I use cinnamon powder in place of cinnamon sticks? I think so! I’m just not sure how much you’d need. I’d start with just a tiny bit and add more at the end if needed. I made this as written other than improvising the charring technique. I also threw in whatever veggies I had in the fridge (I.e. Brussels sprouts, broccoli and cauliflower). Thanks for posting this! It’s a definite keeper and will be made over our Christmas holiday!!! I’m so happy to hear that and I love the additional veggies – especially the Brussels sprouts! Thanks Diane! Is the mushroom dry or fresh? Ok help me…I made this last night and the family loved it BUT the anise flavor got lost from pot to bowl! And what broth do you use? I used the Whole Foods brand and it was really strong. I’m thinking the Pho at our local place is also full of sodium. My kiddos asked for salt in it and when I finally gave in they said it tasted more authentic lol. Oh wow! That’s odd, but you can always try using extra anise when you make it again. I think I used Pacific Foods broth. You can also try bullion or something like Better Than Bullion – that will allow you to just make it as strong as you like. I hope that helps! Ok, good news!!! I ate it for lunch that day after letting it sit out all night and it was glorious!! I suspect I like more of the anise flavor than maybe others. After making this again and letting it simmer longer I realized this might be the perfect pho recipe! Thank you! Yay!! I’m so happy to hear that! Thanks so much Jenny! when you say 4 cloves.. is that garlic? I made this today and it is fabulous! I added broccoli and left out the tofu. It’s very versatile. Thanks so much for this recipe! This is definitely a keeper. Yay! Glad you like it! Thanks Dawn! THIS WAS AMAZING! My whole family enjoyed the rich broth which filled the house with its comforting aroma. Printed the recipe immediately and put it in our recipe binder. Thank you! I am about to make a big batch of the broth and freeze it so we can have it on hand anytime a pho craving comes along…which is a lot! Oh, great idea!! I’m definitely making a double batch and freezing some of the broth next time! I’m so glad this was a hit. Thanks Hannah!